Home→Physio Shop→Special Offers→Coloured Zinc Oxide Tape. The Coloured Zinc Oxide is based on our best selling non elastic tape with excellent adhesion and tensile strength properties. It is avaliable in six colours being Black, Blue, Gold, Green, Orange and Red. The strong tape fabric is dyed and has a soft and supple feel. 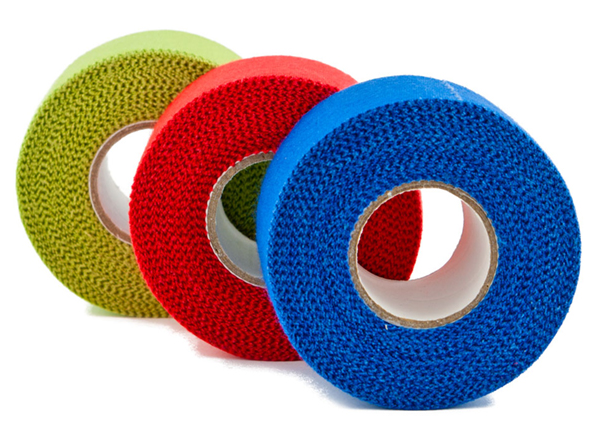 The tape has a computerised unwind design which means it comes off the roll very smoothly and it unwinds to the core.The Colour Zinc Oxide is a very economical Zinc Oxide Tape with strong adhesion, serrated edge and easy unwind. The tape is 9.1m in length and 3.8cm in width. The Coloured Zinc Oxide tape is used for the immobilisation of joints and to blend in to your teams clothes. The smooth unwind means it is very good where you need controlled application, for example when taping hands or shoulders.